Welcome. I am so glad that you stopped by. We are having a beautiful fall day in Southern California- cool nights and warm days in the high 60's near the ocean. Just perfect weather for you to join me and Bentley, my helpful Studio Assistant, in the garden for a cup of hot tea while we look for Blue and White Fall inspirations. My neighbors' Maple tree is just starting to turn fall colors. 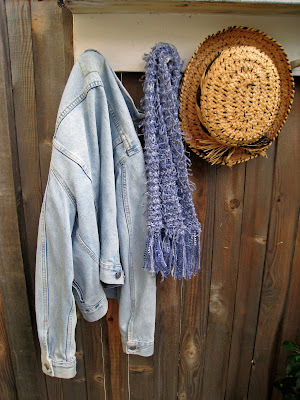 It is cool enough for me to grab a jacket to wear. Off we go . . . . . . . .
Bentley is already to go. One of my customers' saw a Welcome Sunflower door sign on my website http://thepaintedgarden.net/ and asked me to paint her a sign with sunflowers in a blue and white bucket. She collects blue and white china and wanted something that would welcome guests to her home that would represent her love for all things blue and white. 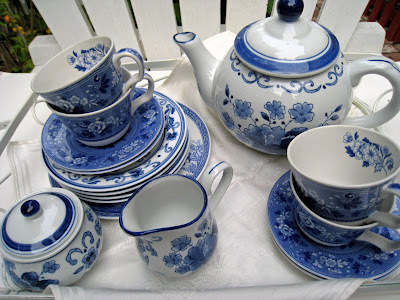 I also collect blue and white china and did not have any problem finding blue and white china for inspiration. I store extra pieces in my old blue cubbard . Looks like Bentley found some Sunflower inspiration. Now that we found our blue and white and sunflower inspirations, Bentley is ready to show you the finished Welcome sing. The sign can be hung on a front gate, picket fence of front door. Thank you for stopping by. I love hearing from you and sincerely appreciate that you have taken time to visit, leave me a comment and follow my blog. If you would like to see me paint something special, please leave me a comment or send me an e-mail. I love that. I have a sign that I have painted and repainted for every occasion coming and going. I wonder sometimes how long I can do that. I love the blue hutch and china on it. What an adorable painting! Blue and white is always so cheerful! Erin, your paintings are just so pretty. Love them! Very pretty! Great photos too! G'mornning, Erin..this is just beautiful, as always. You and Bentley do such marvelous work. Erin, love the sign! Of course, with Bentley's help....LOL! He's a charmer! Everything you do is always filled with so much sunshine! LOVE the blue and white--all your vignettes look like paintings! Hey Erin, Your painting is so fresh. I L-U-V your blue hutch!! I enjoyed catching up on your posts and seeing your fall inspiration and beautiful paintings. What a wonderful giveaway you just had! Congratulations to the winners. Hugs to handsome Bentley. He is a smart boy to stop and take time to smell the roses......er sunflowers.